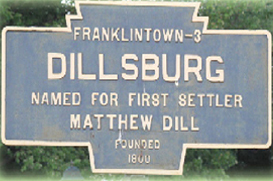 Dillsburg is in south-central Pennsylvania at the crossing of US Routes 15 and 74. The rural feel of the town is supplemented by a convenient location on main highways that allow access to metropolitan areas; this convenient location makes the town a focal point for agricultural products from area farms being moved to market. The town is fifteen miles west of Harrisburg, in York County. It’s currently undergoing a downtown revitalization that makes it an up-and-coming town in the area, along with its plethora of community events, including the annual Farmer’s Fair, Pickle Fest, and New Year’s Eve Pickle Drop.